Couch surfer. 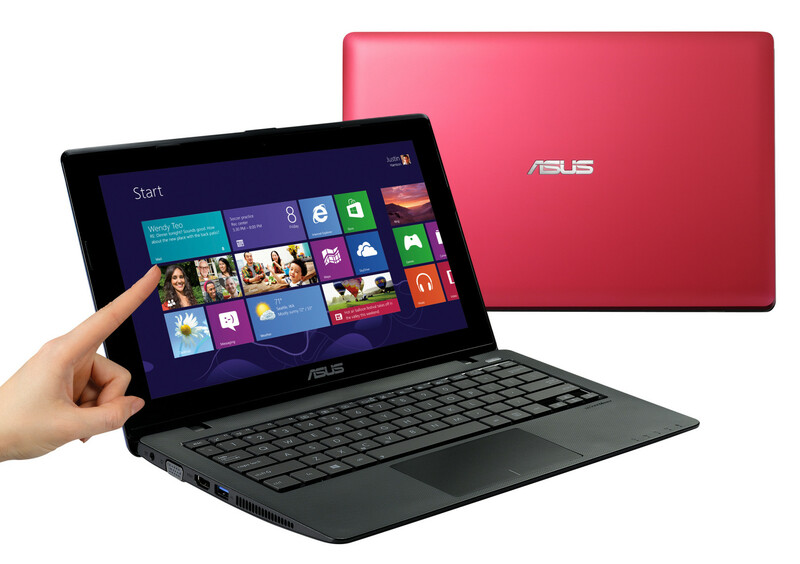 Asus demands 370 Euros (~$507) for its little 11.6-inch F200MA-CT067H netbook. An energy-efficient processor allows for good battery runtimes and quiet operation. Thus, the computer looks good as a browsing machine in the living room. Our report uncovers the netbook's other talents. 10 and 11.6-inch netbooks have received strong competition from tablets and convertibles over the past few years. However, netbooks still seem to enjoy some popularity. Asus wants to cater to this need with its F200MA product line. Our report reveals whether this series is compelling. 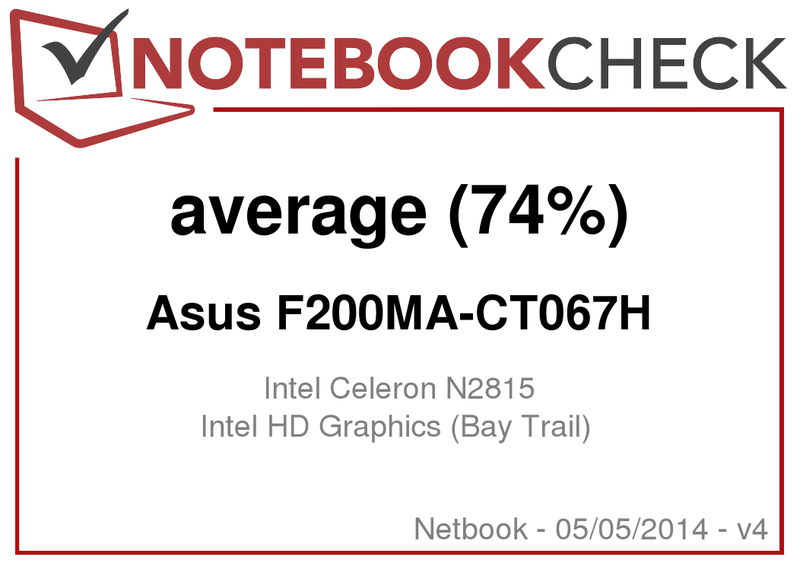 We used the Lenovo IdeaPad S215 (AMD A4-5000, Radeon HD 8330) and Toshiba Satellite NB10t-A (Celeron N2810, HD Graphics (Bay Trail)) to classify the netbook. 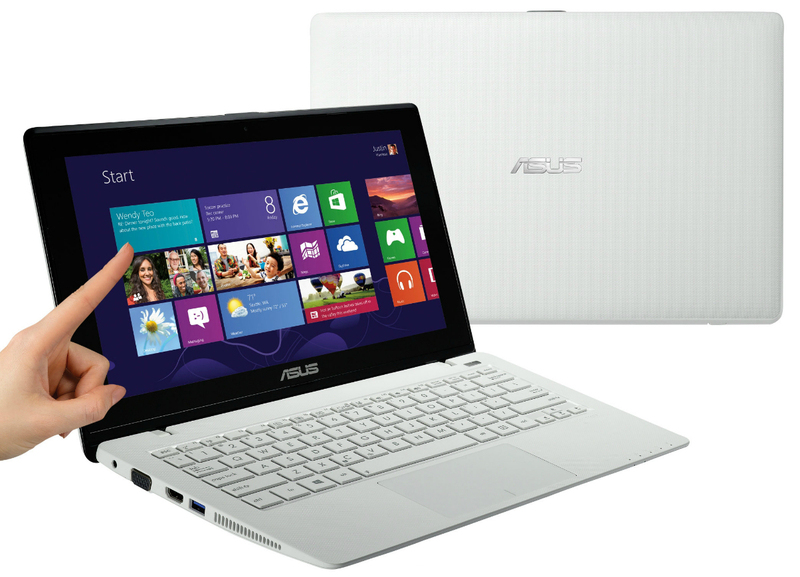 Asus packs the F200MA's technology in a snow-white, plastic casing. The device is available in other colors. The casing has a solid build and does not exhibit any particular instabilities. 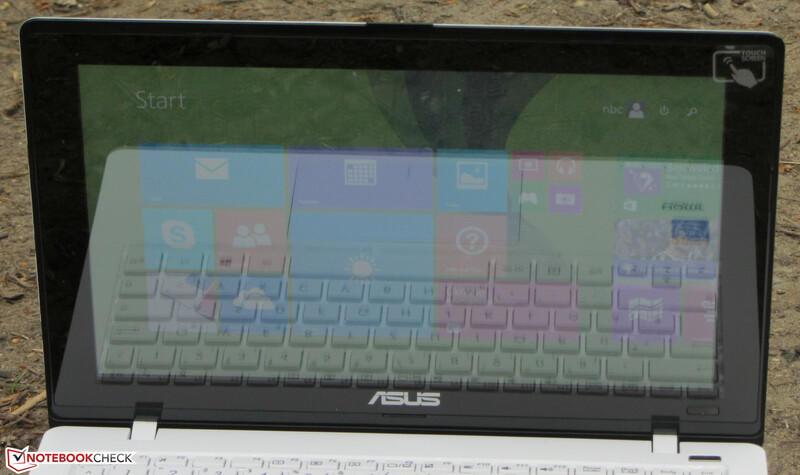 It can only be warped marginally below the touchpad - but that is possible in most laptops. The lid's back proves to be sensitive for pressure. Image distortions are provoked easily. The hinges keep the lid firmly in position. Asus does not treat the little laptop to a maintenance cover, and the battery is incorporated into the device. In terms of interfaces, the F200MA does not have anything special to offer and provides the ports that most laptops feature nowadays. Windows 8.1 (64-bit) is pre-loaded. We did not experience any problems with Wi-Fi reception. The connection was always stable. 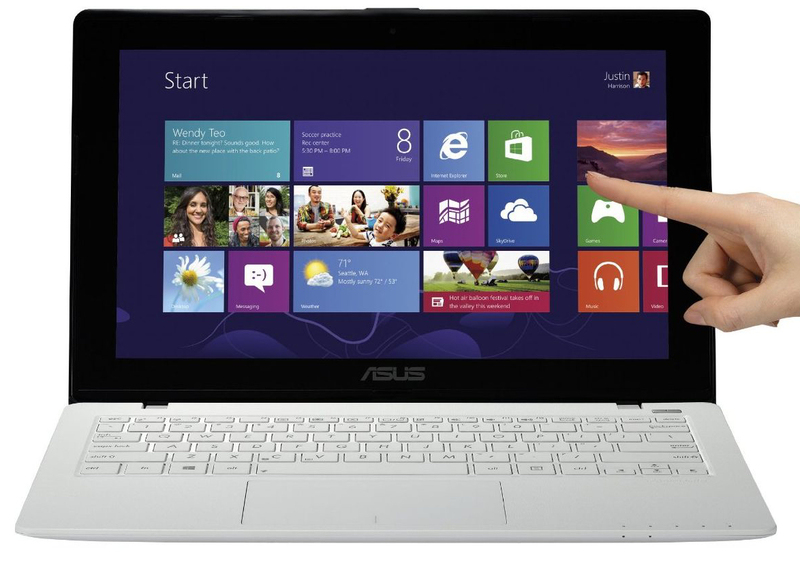 White is the color of choice (picture: Asus). The lid's back is structured (picture: Asus). Left: AC-in, VGA, HDMI, USB 3.0 (picture: Asus). Right: memory card reader, combo audio jack, 2x USB 2.0, Ethernet port, Kensington lock slot (picture: Asus). 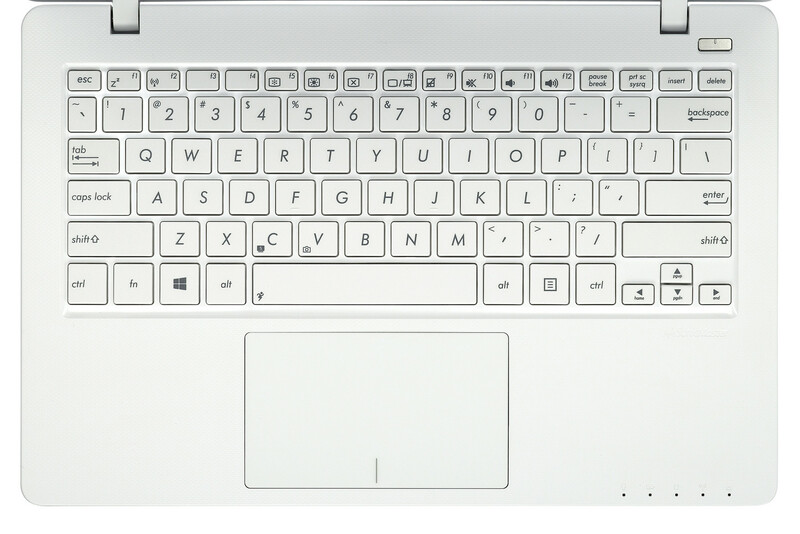 The keys of the unlit chiclet keyboard feature a flat, lightly roughened surface. They have a short drop and clear pressure point. Their resistance is satisfactory. The keyboard slightly yields when typing on it. We did not find that annoying though. The multi-touch supporting ClickPad's size of 10.5 x 6.1 cm is very generous. The sleek surface facilitates swiping with the fingers. The pad has a short drop and a clearly audible and palpable pressure point. A touchscreen is available as an alternative input device. We did not have problems with it, and it responded immediately to inputs. The F200MA is equipped with a glare-type, 11.6-inch screen. Its native resolution is 1366x768 pixels. The brightness of 175 cd/m² will not impress anyone. This rate is no longer contemporary. It looks better with the contrast of 361:1 and black level of 0.49 cd/m², but not really good either. Asus laptops always exhibit good color rates because the company preinstalls color profiles. Consequently, the screen in the F200MA has an average DeltaE 2000 shift of 6.46. The target range of DeltaE less than 3 is quite nearby. The screen at most displays a minor bluish cast. The screen's low brightness and reflective surface prevent outdoor use. Beyond that, the screen can only offer limited viewing angles. However, this was to be expected in view of the netbook's price range. 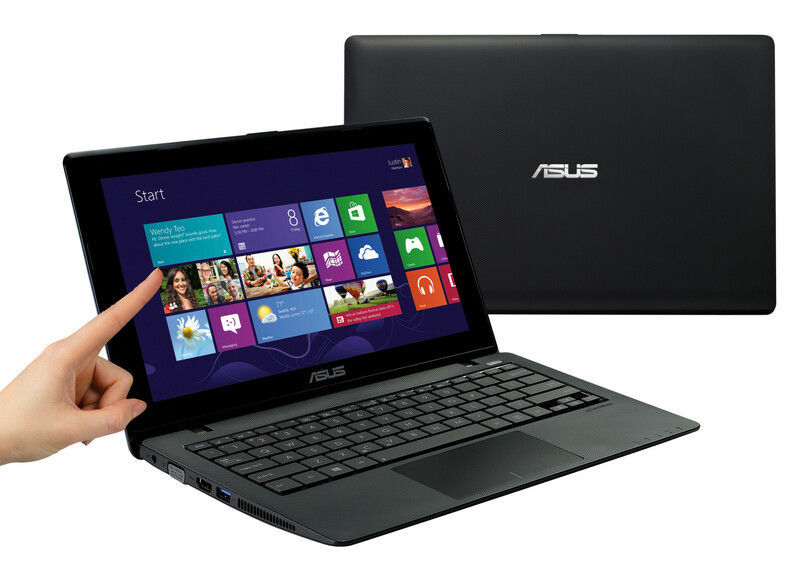 Asus offers a simple, 11.6-inch netbook with the F200MA. It is made for basic tasks like browsing, typing, and video playback. Playing videos is also possible with the device. Our review sample is sold for approximately 370 Euros (~$507). The currently lowest-priced model (F200MA-KX080D) costs around 260 Euros (~$356). The device then does not include a Windows operating system or touchscreen. The buyer also has to live with 2 GB of working memory. The other equipment is the same as in our review sample. The F200MA is powered by a Celeron N2815 processor. This dual-core CPU is based on Intel's Silvermont architecture like all current Atom processors. The Celeron clocks with 1.86 GHz that can be boosted to 2.13 GHz via Turbo. The processor has a TDP of 7.5 watts. The processor's full computing power is always available. The Cinebench CPU benchmarks proved that. All three laptops deliver very similar scores in the single-thread tests. The IdeaPad won the multi-thread tests because it sports four CPU cores. Despite the relatively weak CPU, the system mostly runs smoothly. The weak CPU is occasionally noticed. For example, displaying file content needs a bit of time. The F200MA finished the PCMark 7 benchmark with a marginal lead on both contenders. Data is stored on a Toshiba hard drive with a capacity of 500 GB that spins with 5400 revolutions per minute. The transfer rates are like we know and expect from a 5400 rpm hard drive. Intel's currently weakest graphics core is installed in the little computer with the HD Graphics from the Bay Trail generation. It supports DirectX 11 and clocks with speeds ranging from 400 to 756 MHz. The F200MA and the Satellite present identical scores in the 3DMark benchmarks. The IdeaPad achieves the best results by far because it sports the strongest graphics core. The little F200MA can hardly cope with computer games, if at all. Single games in a low resolution and low quality setting can be played smoothly at most. The fan is usually inactive in idle mode. Only the hard drive's quiet noise and the access noise are heard. Noise will not distract the user much during load either. The fan only increased its speed slightly in the stress test. We measured a noise level of 34.7 dB, which is a good rate. The contenders achieve similar rates. 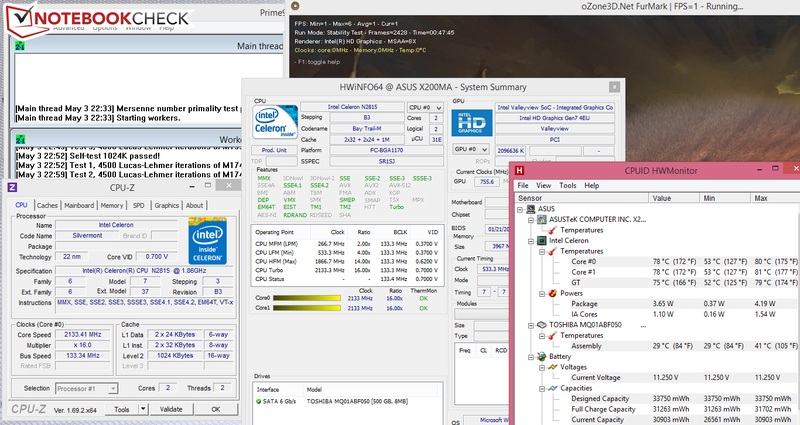 Asus F200MA in the stress test. None of the three computers get exceptionally hot in idle mode. The F200MA and the Satellite surpassed 40 °C at several measuring points in the stress test. The F200MA's CPU and GPU performed the stress test (Prime95 and Furmark run for at least one hour) at full speed (CPU: 2.13 GHz; GPU: 756 MHz) in both AC and battery mode. The CPU's temperature settled to approximately 78 °C in the stress test. (+) The average temperature for the upper side under maximal load is 28.7 °C / 84 F, compared to the average of 29.8 °C / 86 F for the devices in the class Netbook. (+) The maximum temperature on the upper side is 31.3 °C / 88 F, compared to the average of 33 °C / 91 F, ranging from 21.6 to 53.2 °C for the class Netbook. The stereo speakers in the F200MA are located on the casing's front edge on the underside. They are not an audio sensation. The sound is rather thin and lacks bass. The pre-loaded Audio Wizard software cannot change anything about that either. The little F200MA does not exhibit any irregularities in energy requirement. The power consumption is within the range that we expect from netbooks based on the Bay Trail platform. The Satellite's rates are on par, but the IdeaPad consumes more power during load because the laptop sports four processor cores. Websites are automatically opened ever 40 seconds in our practical Wi-Fi test. The energy-saving profile is enabled, and the screen's brightness is set to roughly 150 cd/m². The F200MA achieved a runtime of 5:01 h here. This is a good rate in relation to the battery capacity of 33 Wh. The IdeaPad (5:02 h) is on par while the Satellite (2:52 h) shuts down earlier. 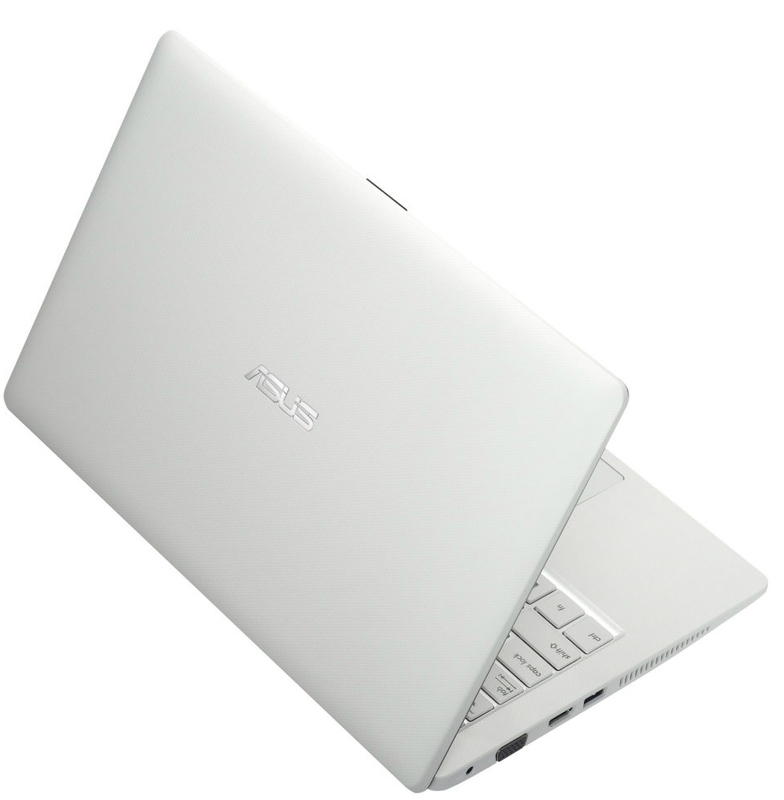 Asus' F200MA-CT067H is a little, 11.6-inch computer that is suitable for Internet surfing, occasional typing, and similar basic tasks. The device operates quietly and does not consume much energy. The battery runtime ascertained in the practical Wi-Fi test is also impressive. The installed screen reaps in the most complaint because it is dark, and its contrast is poor. The netbook's low price level would definitely permit installing a better screen. Lenovo's IdeaPad S215 offers the highest CPU and GPU performance. At the same time, it achieves the same battery runtimes as the F200MA. Besides that, the laptop features a matte screen. The IdeaPad also has the brightest screen out of the three comparison devices. Toshiba's Satellite NB10t-A-101 has the lowest energy requirement of the three comparison computers and the lowest operating noise. It is the only computer with a maintenance cover. The low operating noise, the low power consumption, and the good battery runtimes. A brighter screen with a higher contrast. Asus only includes a one-year warranty, while Satellite and IdeaPad buyers benefit from a 24-month warranty period. Lenovo IdeaPad S215, Toshiba Satellite NB10t-A-101, Lenovo ThinkPad Edge E145, HP Pavilion TouchSmart 11-e000sb, Acer Aspire V5-131, Lenovo ThinkPad Edge E135, Lenovo ThinkPad Edge E130.